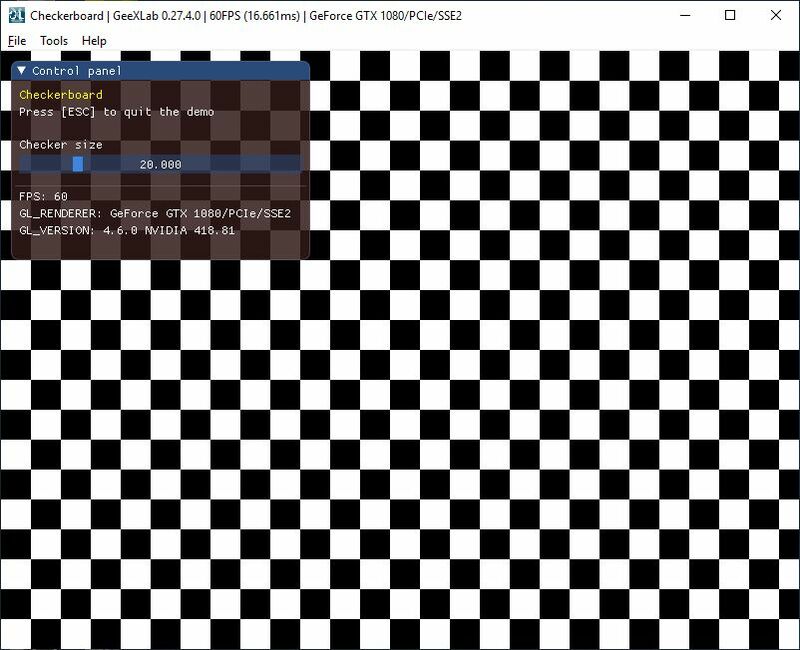 Very simple demo that draws a checkerboard pattern in GLSL. 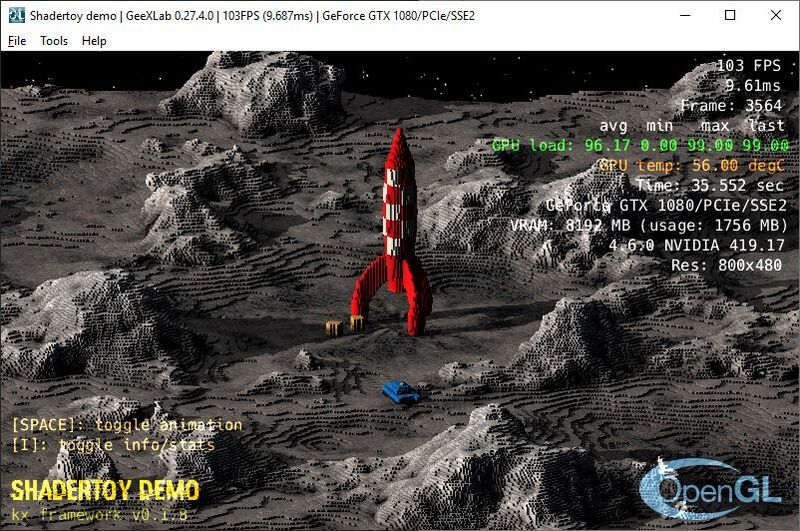 Demo Moon voxels ported to GeeXLab. 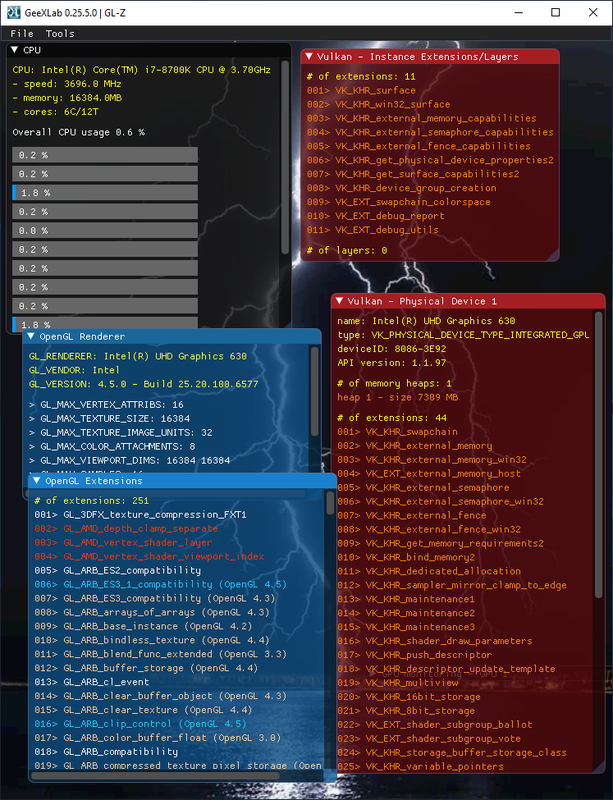 Geeks3D's GPU Tools / Re: Interesting behaviour using the Furmark tool. Thanks, I will try to do something to detect wrong scores, don't know what, but I will try. DXVK is a Vulkan-based Direct3D 10/11 implementation for Linux which allows running 3D applications using Wine. - Minor performance improvement on RADV by generating better shader code. - Minor improvements to CPU overhead in some scenarios. - If available, the VK_EXT_memory_priority and VK_EXT_memory_budget extensions are now used to improve behaviour under memory pressure and to report available VRAM to applications more accurately, respectively. - Resident Evil 2: Enabled new d3d11.relaxedBarriers option to improve performance by up to 10% in GPU-limited scenarios. Note that enabling this option for other games can cause issues. February 25, 2019 — Embedded World Conference —Nuremberg‎, Germany — The Khronos® Group, an open consortium of leading hardware and software companies creating advanced acceleration standards, today announces the creation of the Vulkan® Safety Critical Working Group, to enable safety critical industries to take advantage of advancements in GPU graphics and compute acceleration, and display control, at the highest levels of safety integrity. Safety critical graphics are a key component for industries such as automotive, avionics, medical and energy. As display requirements become more advanced, safety critical graphics APIs must evolve to meet the industries’ needs. Khronos has led the industry in developing graphics API standards for safety critical environments via its OpenGL® SC Working Group, which released the OpenGL SC 1.0 specification in 2005,and the OpenGL SC 2.0 specification in 2016. Now, automotive and other industries are seeking advanced GPU graphics, compute and display functionality that can be deployed in safety critical systems. In response to this industry demand, this new Khronos Working Group will create open, royalty-free API standards based on the existing Vulkan API specification to enable safety critical industries to utilize advanced graphics and compute acceleration. To best suit these market’s needs, the new API will aim to be compatible with industry standards for safety critical software, such as RTCA DO-178C Level A / EASA ED-12C Level A (avionics); FACE (Future Airborne Capability Environment) (avionics); and ISO 26262 ASIL D (automotive). “Advanced graphics and compute functionality is being deployed into an increasing number of markets where safety is paramount, and so APIs designed to streamline the safety certification process are now a key part of Khronos’ standardization activities. OpenGL SC has been widely used in avionics systems, but now the wider embedded industry is demanding access to the latest GPU functionality. Vulkan is the ideal starting point for a new generation safety critical GPU API, as its driver architecture is significantly more streamlined than OpenGL, as well as offering increased control of device scheduling, synchronization, and resource management,” said Neil Trevett, president of Khronos. In the final installment of Ray Tracing Gems, we examine the dramatic impact ray tracing can have on global illumination. Lighting feels warmer, richer, and more realistic using this technique. - Minor graphics anomalies may be observed in Final Fantasy XV* and Microsoft* Edge browser. - OpenGL stability fixes for background applications. - Few Internal panels may show black screen after installing graphics driver. - Content protection may not enable when resuming from sleep after connecting display port monitor. - Rotation may not be persistent when swapping displays in multi-monitor configurations. - Garbage may be seen while using Multi Stream Transport (MST) monitors. - Battlefield V players may experience character outlines stuck on screen after being revived. - Fan speeds may remain elevated for longer periods than expected when using Tuning Control Auto Overclock or manual fan curve in Radeon WattMan on AMD Radeon VII. - ReLive wireless VR may experience an application crash or hang during extended periods of play. - Zero RPM will correctly disable in Radeon WattMan on available system configurations when manual fan curve is enabled. 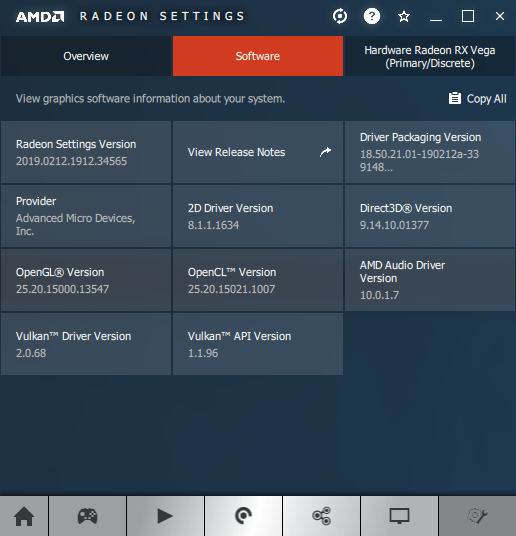 - A loss of video may be intermittently experienced when launching a fullscreen player application with Radeon FreeSync enabled. 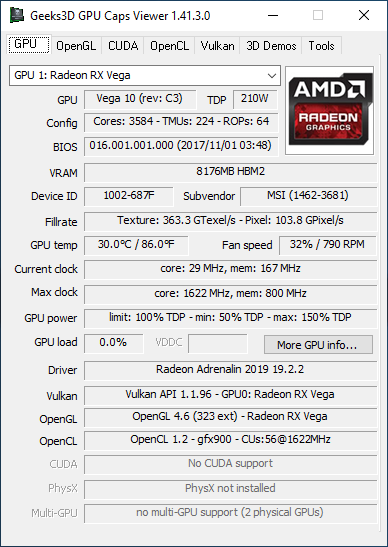 Same OpenGL (4.6) and Vulkan (1.1.96) support than Adrenalin 19.1.1. 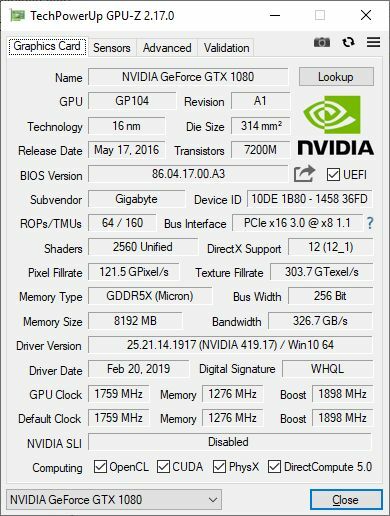 - NVIDIA Control Panel Updated to version 8.1.950. 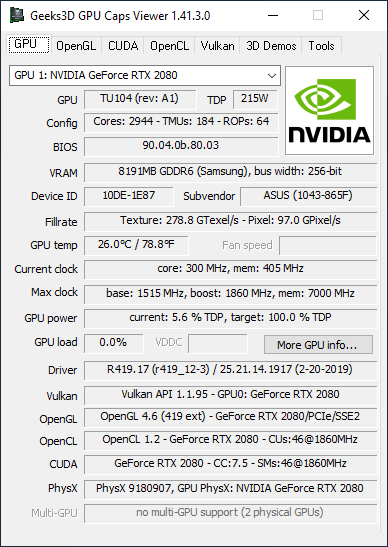 Added new Developer->Manage GPU Performance Counters controls.
. NVENC API has been updated to support HEVC B-frames on Turing GPUs.
. NVENC API adds the capability to output the encoded bitstream, and motion vectors from Motion-Estimation-only mode to video memory. This avoids the overhead of copying the output from system to video memory for processing pipelines operating directly on video memory.
. NVENC API now accepts CUArray as an input buffer. The SDK contains a sample application to demonstrate how to feed Vulkan surface to NVENC using Vulkan-CUDA interop. 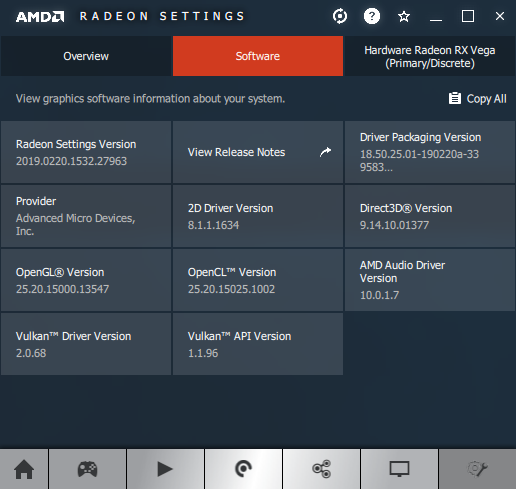 GeForce 419.18 exposes OpenGL 4.6 (419 extensions) and Vulkan 1.1.95 like previous 418.81. * Update release number to 101.
per the styleguide (public pull request 916). discussions of versions and extensions (internal issue 1473). indirect dispatch and draw commands (internal issue 1513). restricting pname:vertexStride to be positive (internal issue 1566). * `VK_EXT_depth_clip_enable` (internal issue 1485). 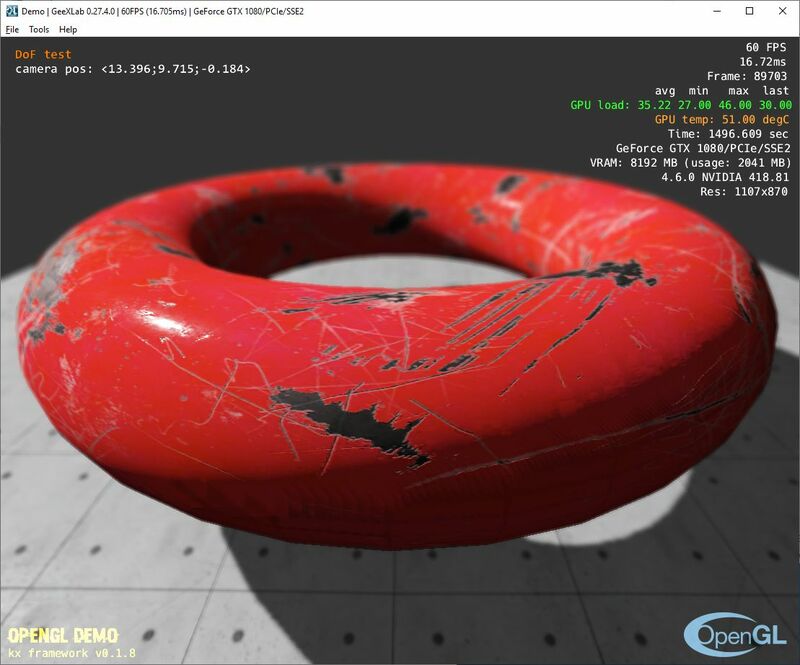 Geeks3D's GPU Tools / Re: Seascape corruptions. Depth of field (DoF) + a bit of PBR (physically based rendering). - Windows 7x64/8.1x64: Fixes random application crash or TDR introduced in previous GeForce display driver 418.81. - [Battlefield 1]: Lines appear in the terrain with NVIDIA Control Panel anisotropic filtering override enabled. 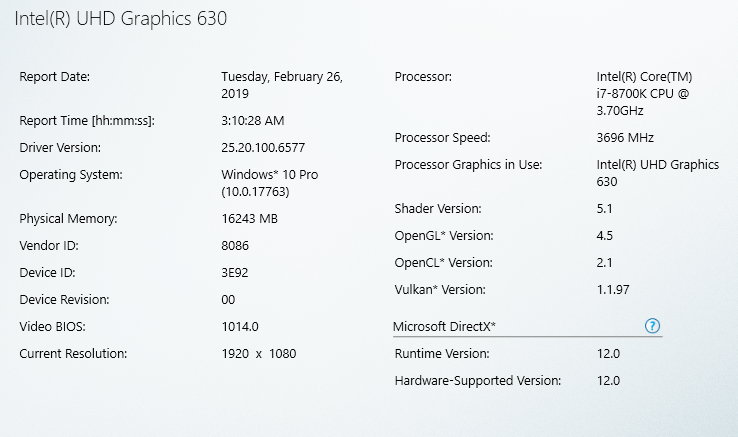 GeForce 418.91 exposes OpenGL 4.6 (419 extensions) and Vulkan 1.1.95 like previous 418.81. 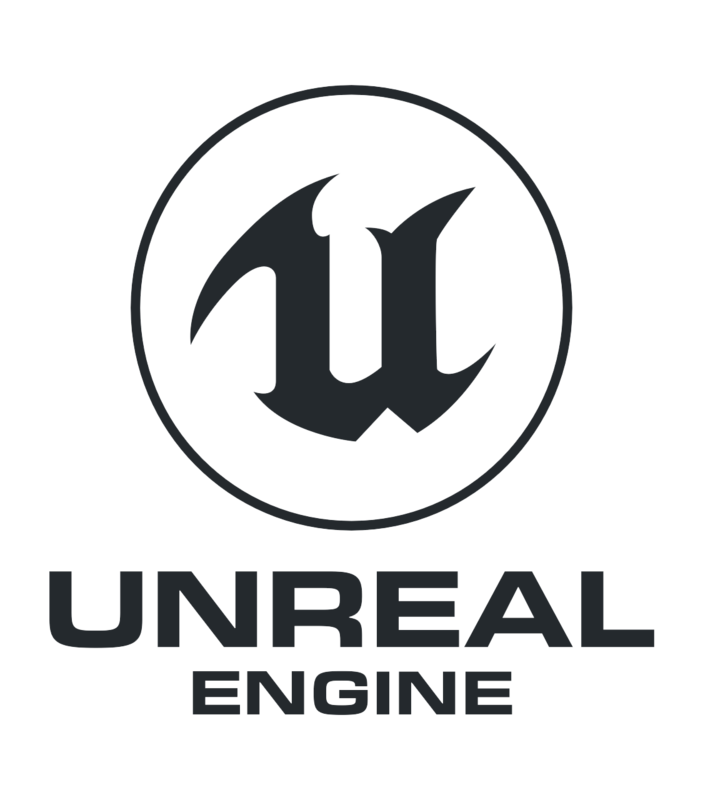 Unreal Engine 4.22 will be releasing soon with a number of fixes and updates. In the meantime, the first Preview is now available for download from the Epic Games launcher. Preview 1 includes support for real-time ray tracing, Editor Utility Widgets, Blueprint indexing optimizations, virtual production updates, Oculus Quest support and the Unreal Audio Engine is now on by default for new projects. - Added ray tracing low level support.